Oscar-winning producer/director Tony Bill (The Sting, Five Corners) is fond of saying that if you’ve got a great script, you can throw it out of your car on the Hollywood Freeway and it will find its way into good hands. But there’s a new crop of script consultants with names like Storybay, Scriptshark, ScriptP.I.M.P. and Studionotes that claim what you really need to do is pay them a few hundred dollars and sign over 5 to 10 percent of your potential profits, and if they think your script is worthy, they’ll pitch it to the Hollywood big shots who regularly peruse their Web sites. If you’re an aspiring writer with no connections, you might think this is a pretty good deal. After all, if they’re able to break you into the big leagues, a few hundred bucks up-front and a piece of the profits is a small price to pay. In my article titled "Home Cooking," find out how Corbin Bernsen — yes, former "L.A. Law" star Corbin Bernsen — is demonstrating that community building can not only help movies get made but strengthen local economies, while he works to establish himself as a writer/director. 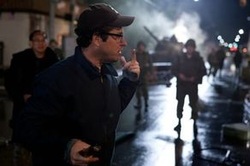 J.J. Abrams on the set of "Super 8." To mark the DVD/blu-ray release of writer/director J.J. Abrams' "Super 8," I did a new Q&A for Filmmaker Magazine with Gerard Ravel, the man behind the Super 8 film festival that first brought Abrams to the attention of Steven Spielberg back in 1982. For a more in-depth look at the fest, which also launched the careers of writer/director Matt Reeves ("Felicity," "Cloverfield") and cinematographer Larry Fong ("300," "Super 8"), check out my blog post "The Real Kids of 'Super 8.'" My Q&A with French Canadian writer/director Philippe Falardeau in which he talks about his Oscar-nominated film "Monsieur Lazhar" and explains how a stint as a contestant on a Canuck reality show turned him into a filmmaker.